Homemade ice cream takes a little more time than picking up a pint at the store, but the end results are always worth the effort. 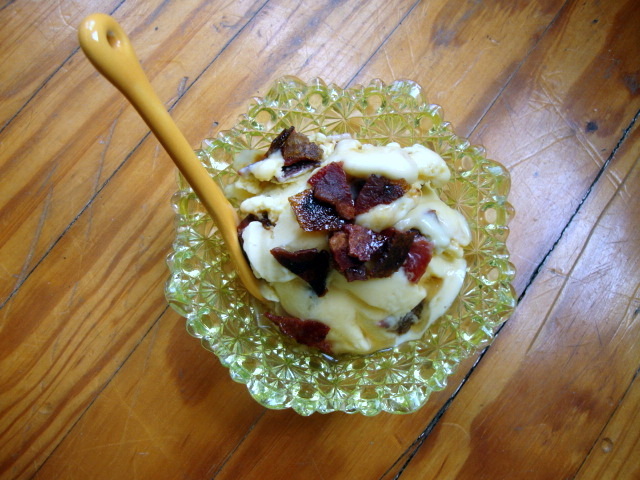 This ice cream tastes like a big bowl of breakfast but better! The base is nice and creamy and just sweet enough to perfectly offset the salty bursts of bacon. The bacon can be candied ahead of time, just store in a baggie in the fridge for up to a week. If you’re looking for a last-minute treat, don’t forget that some ice cream makers require you to freeze the bowl ahead of time. Preheat oven to 400*. Fill a large bowl with ice and water and place a medium-sized, heat-safe bowl down inside the bath. Lay bacon on a lightly sprayed baking sheet and bake for 10 minutes. Sprinkle slices evenly with brown sugar and return to oven for 10 – 15 more minutes, until candied. Watch the bacon carefully the last few minutes to ensure that the sugar does not burn. Remove bacon from the oven and set aside. Once cool, break into small pieces with your fingers. Stir maple syrup and pancake mix into the egg yolks. Bring heavy cream and skim milk to a light simmer in a saucepan over medium-high heat. Slowly stream half of the hot cream into the egg yolk mixture, whisking steadily to ensure that the eggs don’t cook. Then carefully stream and whisk the yolks and cream mixture back into the cream still in the sauce pan on the stove. Continue to cook the custard over medium-low heat until slightly thickened. Take care that the mixture does not boil. Pour custard into the bowl in the ice bath. Stir until cooled. Pour cooled custard into the bowl of your ice cream machine and freeze according to manufacture’s instructions. Remove chilled ice cream and use a spatula to fold in candied bacon. Freeze in an air-tight container for at least 2 hours before serving.